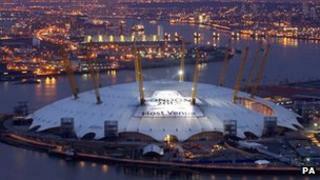 London 2012 created over 5,000 jobs and attracted overseas investment to Greenwich, south London, a report said. The Olympic Legacy Report, published by Greenwich council, said the Games had "substantially boosted" its "already thriving" tourism industry. There had been "major hotel investment", creating a four-fold increase in bed space in the borough in the last two years, it said. In July traders said they lost money when cordons blocked access to stalls. The Greenwich Market traders said cordons blocked access to their stalls depriving them of passing trade from the 2012 equestrian competition on Saturday 28 July. The matter was resolved with the Games' organising committee. The borough hosted Olympic and Paralympic equestrian and modern Pentathlon events in Greenwich Park; gymnastics, trampolining and basketball in the North Greenwich Arena; and shooting and archery in the Royal Artillery Barracks. The authority said more than 5,000 local people had been employed in Games-related jobs, and that it was offering them support in getting long-term work. Chris Roberts, leader of the council, said: "By making bold decisions at the very early stages once the bid to host the Games had been decided in July 2005, the Royal Borough set out some very aspirational legacy objectives. "By consistently managing and reviewing the process and progress, a meaningful legacy has been developed and delivered over the past seven years." He said the benefits for the community included generating job opportunities, boosting the local economy and increasing participation in sport through new facilities. He said a recently-launched campaign had been launched to "maintain the surge in our already booming local tourism industry". "However, this is just the beginning and we will build on the success of the Games to promote these themes even further and to ensure that this Olympic legacy is realised for many generations to come," he added.